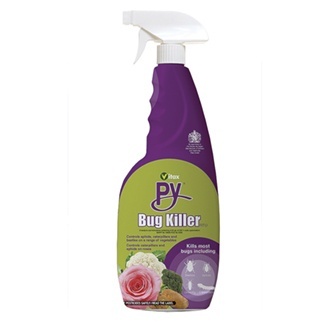 Py Bug Killer is very effective, easy to use insect killer in a ready-to-use spray. It controls greenfly, blackfly, caterpillars and other pests on plants grown indoor or outdoor. There is a 7 day harvest interval. Py Bug Killer contains cypermethrin, and is harmful to aquatic life, bees and pollinating insects. Do not use when bees are actively foraging (use early in the morning or late in the evening). Can be used for both edible and ornamental plants grown outdoor and indoor. Use plant protection products safely and always read the label and product information carefully. Wash hands thoroughly after use and keep out of reach of children and animals.